Talking with villagers in remote villages around the new Lomami Park-to-be can only be done one way: face-to-face. There just isn’t any other way – no other means of communication. 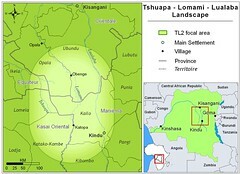 This February, we tried something new near the park’s eastern border, in Maniema province, about 70 km northeast of the city of Kindu where Project TL2 has one of its bases. Our experiment was to try theatre as a way to engage people with ideas about conservation and the park. The village audience was quickly engaged. second: the many reasons why a park is a good idea. Our drama troupe taking off from Kindu with gear and rations tied on the back. We decided to find two actors to perform both skits. While TL2 agent Léon Salumu was scouring the town for talent, I wrote one skit featuring a husband and wife disagreeing about whether or not to welcome visiting hunters in their forests, and another featuring a hungry leopard and a red-tailed monkey, talking about what happens in the forest when the animals have no place of refuge. For the latter skit, I started working on two paper-maché masks. Salumu reported that he found two interested young men at the local radio station. Their talent was immediately obvious. Salva Bapena and LeRoi Kishishi are comic geniuses, with impressive skills in dramatic improvisation. Then, we recruited Omba Florence, the secretary of the local branch of the ICCN (conservation institute) to do some information collecting for us. The leopard and the monkey. We spent about a week rehearsing the skits. Salumu translated from French into Swahili. TL2 agent Maurice Emetshu and I rounded up supplies, food, and five sturdy steel bicycles to carry this small team into the hinterlands. The full court of troubadours. 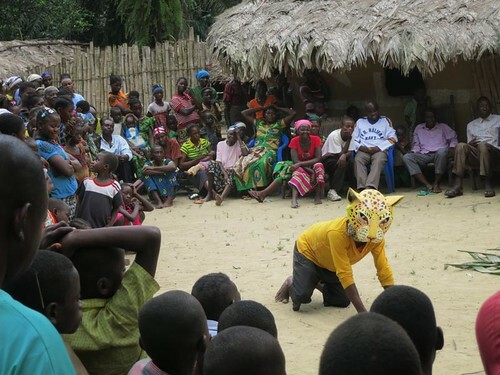 We performed the skits in seven villages- Lomango, Wemambuli, Kakungu, Makoka, Lole, Oluo, and Oleke. 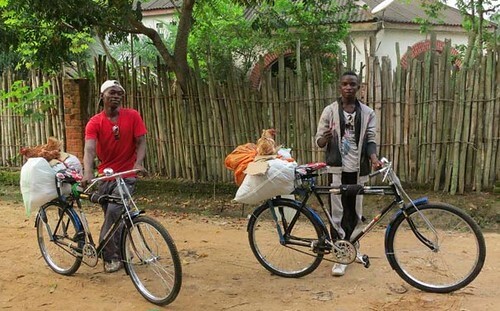 We set off at dawn to beat the sun, riding our heavy bicycles laden with our camping gear, food, oil, water, and usually several chickens, out along the rough, untended road that connects these small settlements to the main road running north from Kindu. The road narrowed at times to a rut no wider than a bicycle tire, and the arrival of the spring rains meant that river crossings were sometimes impossibly hairy traverses of sunken logs, but we made it to each destination. On arrival, we contacted the chief and asked him to summon the villagers for an afternoon presentation. Then we took a rest. Usually at this point we had to send for the village bike-repairman, as the cheap Indian bicycles really couldn’t go more than about twenty km without suffering some sort of severe misalignment of some sort or other. Luckily, every single village, no matter how small, has a repairman- although often such a repairman’s toolkit will be limited to one hammer, and one wrench. Sometimes, just the hammer. One of many narrow crossings. When people returned from their fields, we started the performance, introduced by Mama Omba. 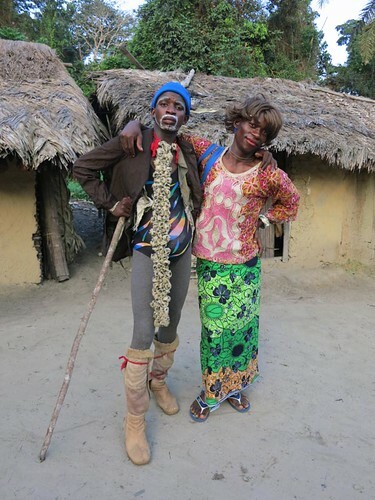 Salva and LeRoi had brought along some hilarious costuming for the first skit- a ridiculous old-man getup for Salva and a pretty impressive drag outfit for LeRoi (He borrowed a length of cloth in each village to use as a skirt). They held the audience enraptured and in hysterics as they argued about whether Salva should agree to borrow a city-dweller’s gun and hunt for him. LeRoi, as the assertive wife, berated her husband for his foolishness and often ended the skit by dunking him in the fufu-pot. The laughter was a good sign- it meant that people were enjoying themselves- and it’s my experience that people are more likely to be receptive to new ideas when they’re having fun. The second skit opened with LeRoi emerging from a doorway clad in the leopard mask- that never failed to scatter the throngs of small children, and not a few adults as well. 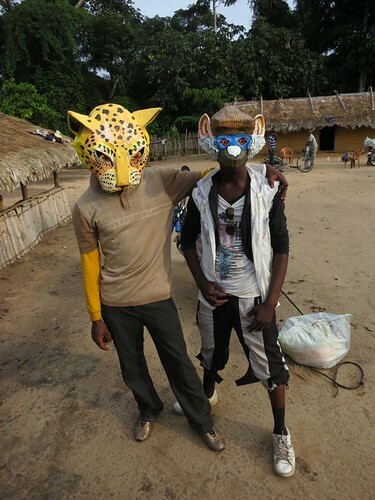 Salva would bound around him in the monkey mask, pretending to not be a monkey, and suggesting that the leopard might find something to eat if he went to explore the new park- then he wouldn’t have to hassle villagers by eating their goats. This all went well until he let slip that he was a monkey himself, whereupon he was chased off the stage by a roaring LeRoi. When the skits were finished, Omba thanked the audience and asked for volunteers to come and answer the questionnaires we’d prepared. These featured four questions- What did you think of the first skit? The second skit? Do you think skits like these are good ways of getting a message across? And finally- do you have any questions for us? The wife ridicules the husband’s visions of bushmeat and wealth. We got a lot of responses. People seemed generally to understand what was being communicated in the first skit. They also expressed understanding of the second skit, but wondered what was going to be done for them after they had agreed to the idea of the park. Everyone agreed that the skits were great fun. And then there were questions. Lots of questions. Will you fix the road? Will you build bridges? We need a list of protected species so we don’t fall foul of the park guards. We need schools and a clinic. Mama Omba carefully wrote everything down. Our little skit was clearly the event of the day. 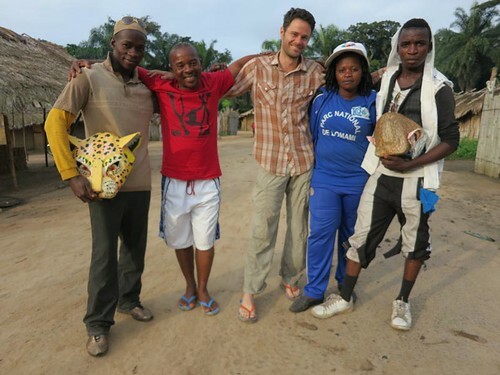 At the end of the trip, Maurice and I put the actors and the secretary onto motorcycles and sent them off to Kindu, and then he and I headed into the forest. We all felt that the experiment had been an unqualified success. People enjoyed themselves, the message was communicated, and we had successfully taken the temperature of public feeling about the park and Project TL2’s efforts in this small region. Another important thing- this project was cheap. We got it all done on a shoestring budget. We have shown what can easily be done up and down all the roads ringing the southern portion of the park. 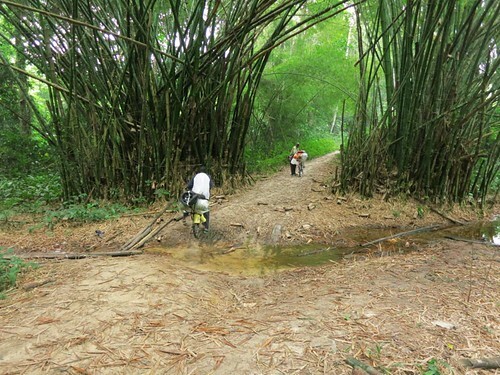 In a remote region with no infrastructure, certainty comes with simplicity. This post by Roger Peet — Great contribution, Roger. Thanks from all of us. How to Move a Village ? This entry was written by Terese Hart, posted on 2014-04-02 at 9:14 pm, filed under About the project, community conservation, Indigenous peoples. Bookmark the permalink. Follow any comments here with the RSS feed for this post. Post a comment or leave a trackback: Trackback URL. I am beyond-impressed with this creative project. The leopard and monkey masks were wonderful! Well done! Great idea, taking your show on the road. The masks, costumes, and acting are great. Thanks for the delightful post. A very creative idea … injecting some fun into what can sometimes be grim business! 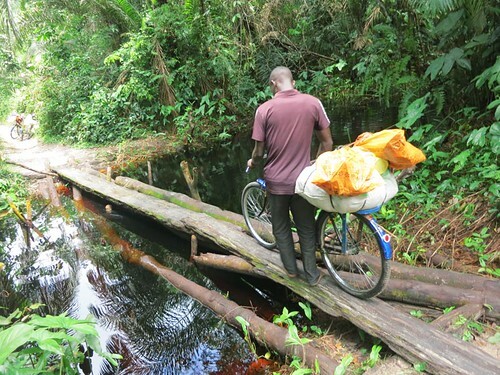 and now the bushmeat trade in DRC – keep up the good work…. love it.